Dal Makhani, a healthy and nutritious combination of whole black gram and red kidney beans in an Indian style curry. This is a nutrient dense food when served with roti / rice and sabzi. Prepare this curry for dinner or lunch. For vegan friendly version, skip dairy cream which is an optional ingredient. This is not a traditional dal makhani recipe. I shall share the another version soon. Regarding the grayish color of the dal, as this was shot for a client, I have added extra cream to make it more thick. Please check the old photograph of dal makhani, which is the exact color you will get by following the recipe. Dal Makhani was in my hit list for this week. It is my hubby’s favorite and of course mine too. But i never had chance to try it at home. When i saw the split black urad dal packet at nearby supermarket, I immediately grabbed those and here is the result. The nice aroma of dal along with spices was spread through out my house. This recipe is also one among the series of products I shot for Ancient Cookware. The other recipes are Dindigul Chicken Biriyani, Hyderabadi Veg Dum Biryani, Village Style Chicken Curry & Mint Peanut Chutney. This Copper Kadai can be used to serve curries. Those who wish to buy products from Ancient Cookware, let it be indian pots or any products from their store, can avail a discount of 5 % by using coupon code : Preeti. You need to use this code at the time of checkout. Some of the dal recipes shared in my blog, Methi Mooli & Moong Dal, Masala Masoor Dal, Dal Tadka, Panchratan Dal & Dhaba Style Dal. If you try any of my recipes, do share your feedback with us. Soak black gram and red kidney beans overnight in water. You can either pressure cook dal or cook in a pan. If using pressure cooker, then cook dal with enough water for 10 whistles along with ginger garlic paste and little salt. 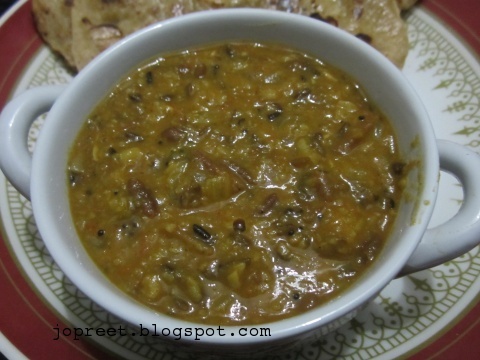 If using pan, then cook on low-medium flame till dal becomes soft and mushy. Mash cooked dal and keep aside. Heat 2 tsp oil in a kadhai or non-stick pan. Temper mustard seeds and add cloves, cinnamon stick and cumin seeds. Saute a while and add chopped onions. Add remaining ginger-garlic paste and tomato puree. Mix well and add mashed dal. Add turmeric powder, coriander powder, chili powder and asofoetida. Now, Add water if needed and salt to taste. Mix everything well and cook it covered over low flame for 15 mins till nice aroma comes. If using cream, then add it once dal is cooked well. Remove from the fire and serve hot with any Indian bread variety. You didn't add any cream ? Healthy dal makhni…good recipe! Yes mahi.. i didn't add any cream.. i usually avoid using cream in my recipes..